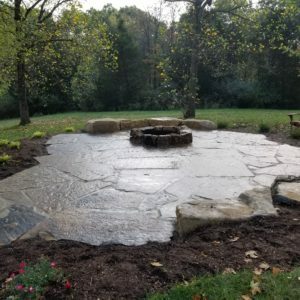 Most people are generally familiar with the standard concrete patio, but there are other options to consider when designing a new backyard gathering space. 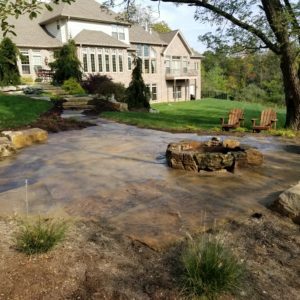 Our industry refers to patios, driveways, walkways, and stairways as “hardscapes” because they require similar creativity and design work to landscaping, but use stone and other “hard” materials. The backyard patio is the living room of your backyard. It is where your family and friends gather to enjoy BBQ in the summer months or sit out and have a glass of wine on a nice evening. If you are thinking of adding a patio or replacing an old one this year, we have some different options for you to consider. A couple of our favorite materials for patios are stone pavers and flagstone. Check out the guide below to determine which may be the best for your needs. Stone paver patios offer a more uniform, level patio if you are looking for a crack-resistant alternative to concrete that will still be fairly easy for your kids to play (or roll) on. We say crack-resistant because pavers are set on an aggregate base, which means you will never have cracks like you do with a concrete patio. 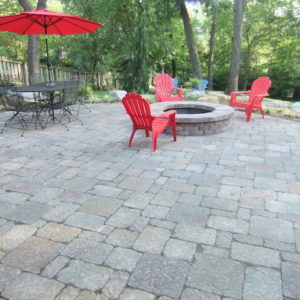 There are two types of paver patios; permeable and non-permeable. Permeable paver patios are made with more space between the pavers so rainwater can easily flow through them instead of drain into sewers. 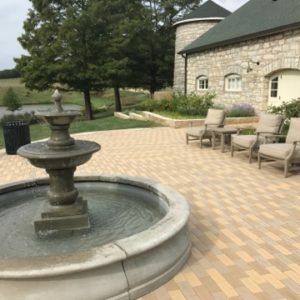 Permeable pavers are becoming more and more popular because many municipalities, (Ladue and Frontenac for example), require them to help with stormwater management. 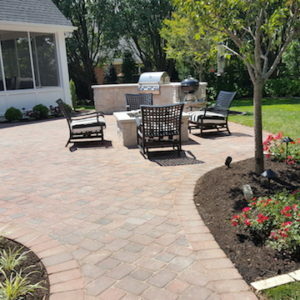 Non-permeable paver patios are the traditional way of installing them and those are still a popular choice as well. There are many paver brands with varying degrees of construction technology and warranty. We are partial to Unilock brand pavers for their lifetime warranty, technological construction, and natural-looking beauty. Not all pavers are created equal. This is an inexpensive paver that has worn down over time, exposing the aggregate. It becomes a problem when you have to replace some of them and the result is a mixed appearance most people aren’t happy with. 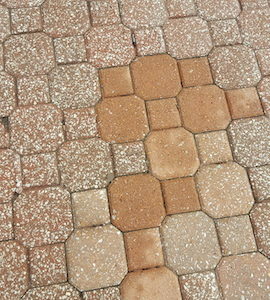 You can prevent this by choosing a higher quality paver that will cost more in the beginning, but that is constructed properly to allow for even wear. If you aspire for your hardscapes to blend more with nature, a natural flagstone patio may be more your taste. Taking naturally occurring materials from the earth and repurposing in a patio or walkway creates a very authentic and rustic feel in your outdoor space. Although sometimes less uniform, flagstone patio surfaces provide a beautiful appeal and are naturally slip-resistant. 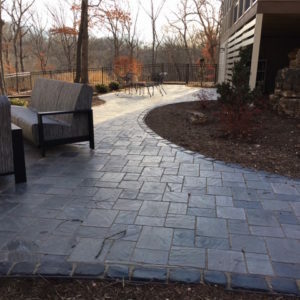 Flagstone patios are extremely durable, natural looking, and can also be permeable depending on the jointing selection and how they are installed. 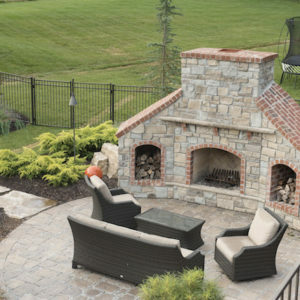 You cannot achieve the naturally occurring colors or patterns which natural stone offers with a manufactured paver, which leads to each project being unique in and of itself. Popular types of flagstone are slate, limestone, or sandstone. 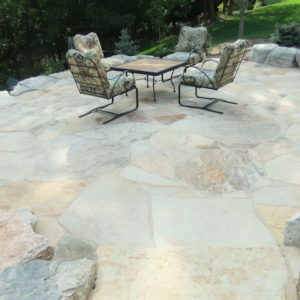 We love flagstone patios for their natural beauty and durability. However, since flagstone is a natural material, you won’t find them guaranteed the way manufactured pavers are. Tune in to Frisella’s All Around the Yard radio show Saturday, February 3rd from 1-2pm on 97.1FM for Tony and Tom’s further discussion on patio design, or download the podcast, here.